The way that the planets appear in our skies depends on whether the orbit of the planet is larger or smaller than the orbit of the Earth. Figure 1.24 shows Venus representing the two planets (Venus and Mercury) with smaller orbits, and Mars representing those with larger orbits. The planets are shown at three instances. In position 1 all three planets are lined up with the Sun, a very rare occurrence but a useful one for describing the view from the Earth. The planets move at different rates around their orbits, so this alignment lasts only for an instant. In position 1, Venus is between the Earth and the Sun. It is then at what is called inferior conjunction. The alignment is rarely exact, because of the inclination of the orbit of Venus. Exact or not, our view of Venus is drowned by the overwhelming light of the Sun. 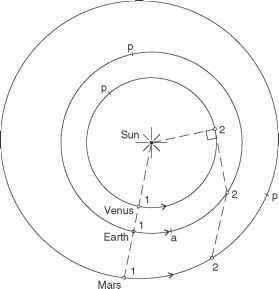 The greater angular speed of Venus in its orbit then causes it to draw ahead of the Earth and we start to see part of the hemisphere illuminated by the Sun as an ever-thickening crescent. At position 2, Venus has reached its greatest angle from the Sun and is at what is called its maximum western elongation. It is now relatively easy to see (before sunrise) and half of its illuminated hemisphere is visible. As it moves on we see even more of its sunlit hemisphere, but it is getting further away from the Earth, and closer in direction to the Sun, until at superior conjunction Venus is pretty well in the direction of the Sun again, but now on the far side of the Sun. Subsequently, it moves towards maximum eastern elongation, then again to inferior conjunction, and the whole cycle is repeated. For planets beyond the Earth, such as Mars in Figure 1.24, the sequence of events is different. The line-up with Mars and Earth on the same side of the Sun does not result in an inferior conjunction, but in what is called an opposition, Mars being in the opposite direction in the sky from the Sun, as viewed from the Earth. Mars is then well seen, with the illuminated hemisphere facing us, and the separation between the planets being comparatively small - though this distance is different from opposition to opposition. Figure 1.24 The motion of Venus and Mars with respect to the Earth. Perihelia are denoted by 'p', and Earth's aphelion by 'a'. □ When will the opposition distance between Mars and the Earth be a minimum? It will be a minimum when opposition occurs with the Earth near aphelion, and Mars near perihelion. After opposition the greater angular orbital speed of the Earth causes it to overtake Mars 'on the inside track' as the configuration moves towards superior conjunction, with Mars on the far side of the Sun as seen from Earth. The time interval between similar configurations of the Earth and another planet is called the synodic period of the planet. Opposition and inferior conjunction are important types of configuration. For any type of configuration the synodic period varies slightly, mainly because of the variations in the rate at which the Earth and the planet move around their respective orbits, as described by Kepler's second law. It is thus the mean value of the synodic period that is normally quoted, as in Table 1.1. For a particular planet the mean synodic period is the same for all types of configuration. These mean periods are not simple multiples or simple fractions of the sidereal year, and so successive configurations have the Earth at different points in its orbit. Figure 1.25 The Moon's motion around the Earth, as the Earth orbits the Sun (not to scale). unilluminated hemisphere faces the Earth, and we have a new Moon. A quarter of an orbit later, at B, half of its illuminated hemisphere is facing us, and we see a half Moon, also called first quarter. At C the fully lit hemisphere faces the Earth, and the Moon is full. At D, three-quarters of the way around its orbit from A, we see another half Moon, the third quarter. We then get another new Moon at A, on average 29.53 days after the previous new Moon. The plane of the Moon's orbit is inclined by 5.16° to the ecliptic plane, which it crosses at the two nodes labelled B and D in Figure 1.25(a). This orbital inclination means that for this configuration, the Moon, as seen from the Earth, cannot pass in front of the Sun, nor can the Moon be touched by the Earth's shadow. However, as the Earth moves around the Sun, the Moon's orbit stays (almost) fixed with respect to the distant stars, so that about a quarter of an Earth orbit later (3 months) the nodes lie on or near the line that joins the Earth and the Sun, as in Figure 1.25(b). If, at this time, the Moon is sufficiently near the node between the Earth and the Sun, then, as seen from the Earth, part or all of the Moon will pass in front of the Sun, and we get a solar eclipse. If the Moon is at or near the other node then the Earth's shadow will fall on part or all of the Moon, and we get a lunar eclipse. The nodes line up twice a year, and usually the Moon is sufficiently near a node for there to be an eclipse of some sort. There are different types of solar eclipses. 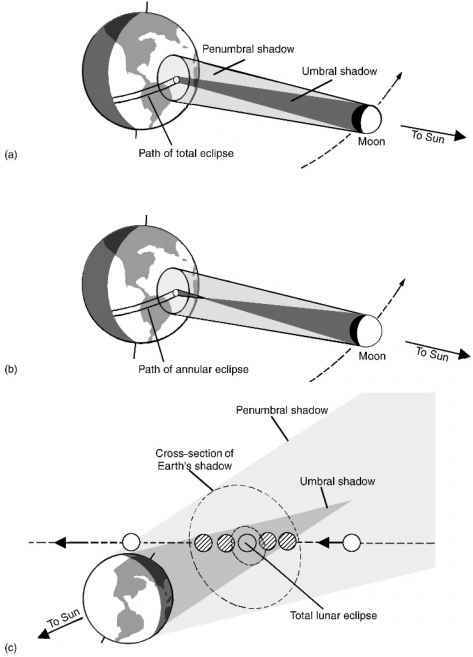 Figure 1.26(a) shows umbral and penumbral shadows of the Moon on the Earth. If we are at a point on the Earth's surface within the umbral shadow then the photosphere of the Sun is completely obscured and we see a total solar eclipse. With the photosphere obscured, we see the pearly white solar corona (Plate 2), the chromosphere, and prominences (Plate 3). It is worth making a considerable effort to see a total solar eclipse, which is a most magnificent spectacle. If we are in the penumbral shadow the Sun is only partly obscured and we see a partial solar eclipse. If the Moon is too far from the node, then the umbral shadow misses the Earth completely, and nowhere on Earth can we see a total solar eclipse. Even with the Moon at the node, not all solar eclipses are total. The Sun is about 400 times the diameter of the Moon, but it is also about 400 times further away, so the angular diameters of the two bodies are nearly the same, about 0.5°. Because of the eccentricity of the orbits of the Earth and the Moon, this coincidence means that sometimes an eclipse occurs with the Moon's angular diameter a bit smaller than that of the Sun, as in Figure 1.26(b). The umbral shadow does not reach the Earth, and from the Earth's surface, at the centre of the penumbral shadow, a thin ring of the photosphere is still exposed. This is called an annular solar eclipse. Largely because of tidal interactions with the Moon, the distance between the Moon and the Earth is currently increasing at a rate of about 25 mm per year, and so, from about 1000 Ma in the future, the Moon will never be close enough to the Earth to produce a total solar eclipse, and all solar eclipses will then be partial or annular. 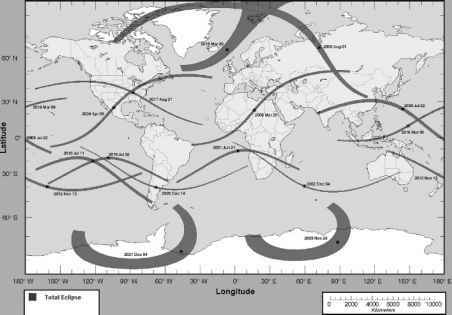 Figure 1.27 shows the umbral shadow paths for the years 2001-2025. Within these narrow paths a total solar eclipse occurs. The paths are determined by the line-up of the Earth, Moon, and Sun, and by the combined effect of the orbital motion of the Moon and the rotation of the Earth, which together sweep the umbral shadow across the Earth. The duration of totality is longest at the centre of the path, and varies from eclipse to eclipse. The longest durations, approaching 7.5 minutes, occur when the Earth is at aphelion, and the Moon is closest to the Earth, at what is called perigee. is not completely dark. Sunlight is refracted by the Earth's atmosphere, red light more than the other visible wavelengths, which can give the Moon a coppery tint. At any moment the eclipsed Moon can be seen from half the Earth's surface. The view from the Moon would be of the black, night side of the Earth, surrounded by a thin red ring of sunlight refracted by the Earth's atmosphere. The nodes of the lunar orbit are not quite fixed but move around the lunar orbit in the retrograde direction in 18.6 years. How does this explain why eclipses are not confined to particular months?